Rabbit is the hardworking, serious character of the bunch. Rabbit may come across as a bit stubborn and short-tempered, but in the end, Rabbit knows how to let go. He's very organized and loves to stay busy by tending to his garden. 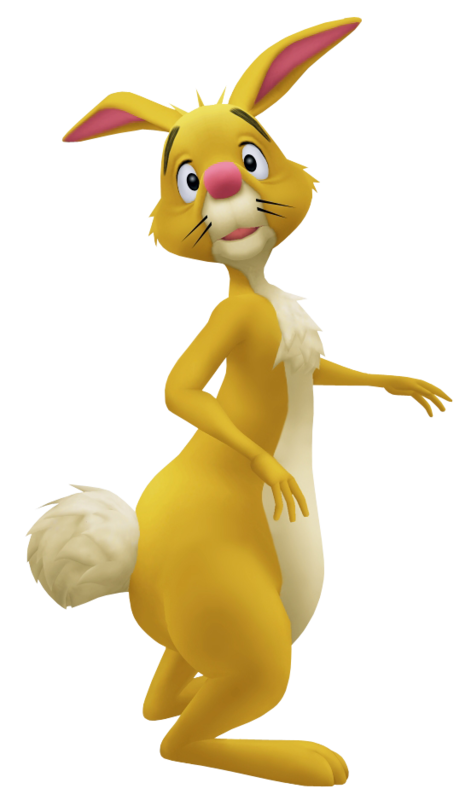 When Sora first enters the area that holds Rabbit's house and his garden, Sora finds out that Pooh has gotten stuck in a hole in Rabbit's house. Rabbit tells Sora that all he needs is a bit of carrot juice and Pooh will pop out. However, that's when Tigger comes onto the scene, as he proclaims Rabbit's garden as his new bouncing grounds. A hard working rabbit who resides in the 100 Acre Woods. Rabbit owns a large plot of land which he uses to grow vegetables he can find pride in. Pooh often visits Rabbit for lunch, and more often than not, empties his reservoir of honey in the process. Like most of the animals living in the 100 Acre Woods, Rabbit met Sora during his first adventure and was rather happy to see him again during his second journey. That is, until Pooh's condition forced him to invest his entire stock of honey in trying to get Pooh to remember him. Regardless of the grief, Rabbit always stayed by Pooh and Sora's side, and when the time finally came for Sora to go again, Rabbit was the one who promised him always a place to come back to. Rabbit's not a bad person. All he wants is some peace and quiet while he tends to his gardens, but somehow he is always in danger of running out of honey or losing his prized vegetables. Nevertheless, he knows his friends do not have any bad intentions and you can always count on his hospitality (no matter how reluctant he can be). He is seen briefly, trying to escape being crushed by a pumpkin speeding downhill toward a stack of honey.